Does a Laparoscopic Skills Training Curriculum on a Virtual Trainer in a Busy Surgical Residency Program Need to Be Optimized? Basic laparoscopic surgical skills and procedural skills training on virtual trainers have become an integral part of a good surgical residency program. However, a standardized curriculum on the VR trainer is missing. Moreover, the literature supports the fact that the skills training on LapMentor has construct and face validity, but there are no data on whether the basic skills training has an intrinsic value in complementing the procedural skills training. Is there a value to a Lap Mentor Curriculum? Should we do basic skills training first or does it not matter? 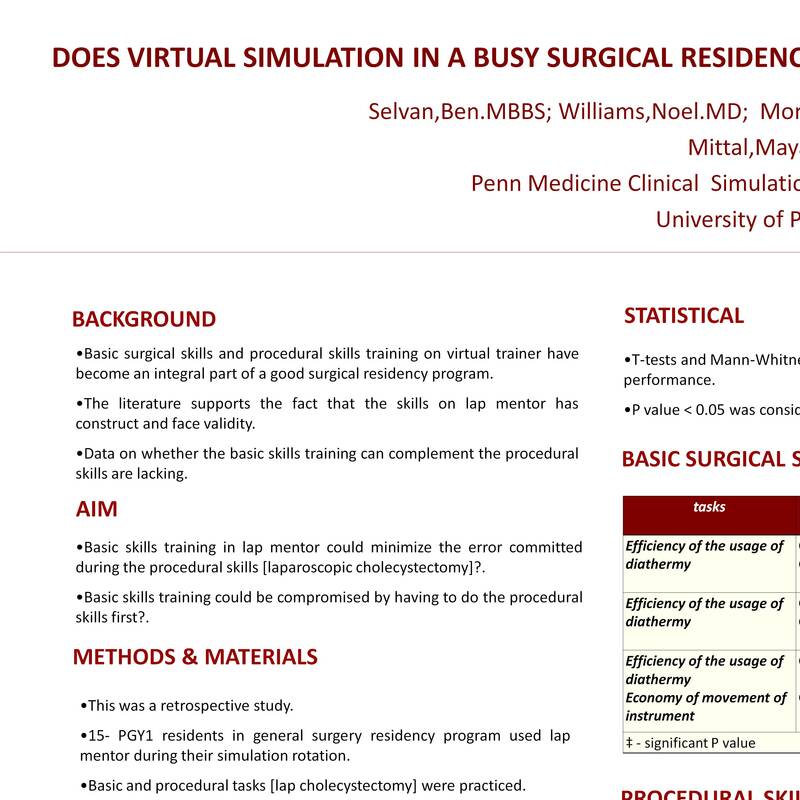 This was a retrospective study, where 15 PGY1 residents in a general surgery residency program had training in lap mentor basic and procedural tasks [lap cholecystectomy] during their rotation at the simulation center. Their performance in total cautery time, efficiency of cautery (%), accuracy rate – applied clips (%), number and economy of movements of instrument (%), total path length of clipper and instrument (cm), were compared between two groups. Group I had their procedural skills followed by basic skills training and Group II had their basic skills training followed by the procedural skills. T-tests and Mann-whitney test were employed to compare their performance. P value < 0.05 was considered as statistically significant. The analysis on other areas did not reach statistical significance. Even though the total clipping attempts did not reach the statistically significant level, this could be a sampling error. and underlines the value of a systematic training curriculum.